Some 20 years ago I bought an obscure Philips/Harlekijn LP containing the famous Ballet Mecanique by George Antheil. In 1924 Antheil worked with Fernand Leger on a DaDa inspired abstract film called “Ballet Mecanique”. The music for this film was to come from electric bells, tree airplane propellers, a siren and piano rolls in 16 player pianos linked to a central control panel. However, the technology to realize this “central control panel” to synchronize all these player pianos was yet not available in 1924, so Legers film and Antheil’s score went their separate ways. The Ballet Mecanique score was technologically so ahead of its time, that it could not be performed in the way it was conceived in the 1920’s. To resolve this issue, Antheil prepared a new reduced version of the piece for eight pianos, one player piano, four xylophones, percussion and two airplane propellers. This drastically simplified score was presented to audiences in 1926 and 1927 in Paris and New York. The work was never published in its original form. In 1953 a heavily cut version of Ballet Mecanique was published by George Antheil which featured only four pianos. This is the score of which a live version played during the 1976 Holland Festival was recorded for the above mentioned Harlekijn LP. Last year I stumbled across a DVD called “Bad Boy made Good. The Revival of George Antheil’s 1924 Ballet Mecanique” on the antheil.org web site. The DVD documents a revival of the original orchestration of Antheil’s magnus opus using the 16 player pianos for which the piece was originally intended. Using MIDI technology to control the 16 player pianos (for which now Yamaha Disklaviers were used), it was now possible to synchronize the pianos in the way Antheil originally intended in 1924. The DVD documents the preparation and the world premiere of this original version of the Ballet Mecanique in the Concert Hall of the University of Massachusetts in Lowell on November 18, 1999. It also contains the Léger film with the newly realized 16-player-piano version of Antheil’s score. The MIDI controlled piece was subsequently performed in many concert halls in the USA and Europe, a complete list of performances and DVD ordering info can be found on the informative Ballet Mecanique page/antheil.org web site which accompanies the DVD. 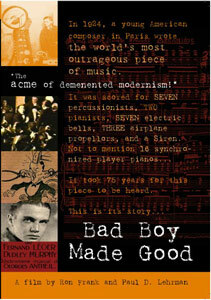 Check it out if you are interested in the early history of “noise music”. Daan Roosegaarde is quickly becoming the most well known of the new “Dutch Digital Design” group of artists. Check his latest project “Lotus 7.0”: a living wall made out of smart foils which move in response to human behavior on his cool Studio Roosegaarde web site.